Looking for rent a Bobcat E42 Mini-Excavator in Rochester NY, Ithaca NY and Western New York? 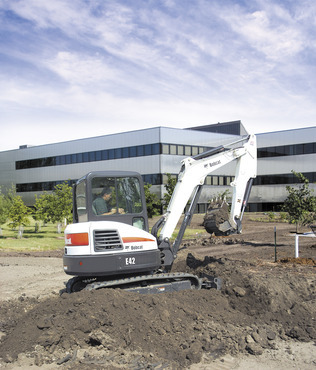 The Duke Company is proud to feature Bobcat Mini Excavator Rental equipment. Incredible operability via fingertip control boom which removes the use of a foot pedal control. Auto idling capability for fuel efficiency and sound reduction. Very easy to change controls from excavator to backhoe. Highly engineered load sensing capability. Maximum RPM (Governed): 2,200 RPM. Operating weight = 9,246 pounds. Travel Speed at Minimum = 1.5 miles per hour. Arm digging force = 5,762 pounds. Bucket digging force = 6,968 pounds. LIft capacity (rated) = 4,603 pounds. Digging depth at maximum = 10.5 feet. Dump height at maximum = 12.2 feet. Reach maximum at ground level = 17.3 feet.